2013 Kia Proceed GT pictures and specs | What Car? 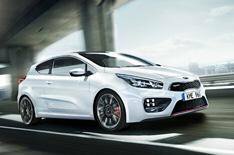 These are the first pictures of the Kia Proceed GT, a new hot hatch version of the Kia Proceed. It goes on sale this summer, alongside the five-door Ceed GT. The Ceed GT will be a rival for cars such as the Ford Focus ST and the next Volkswagen Golf GTI 5dr, while the Proceed GT will compete with three-door cars such as the Volkswagen Scirocco and Renault Megane Renaultsport. Both new models get a range of changes over the standard Ceed and Proceed models they're based on. Power comes from a turbocharged 1.6-litre petrol engine that develops 201bhp and 195lb ft of torque. Kia quotes a 0-62mph time of 7.9 seconds. Chassis changes are also likely - we'd expect stiffer suspension, and possibly tweaked steering. On the outside, GT models get a bold makeover, with deeper, more aggressively shaped bumpers, side sill extensions and a rear spoiler. At the front there are mesh grilles, a GT badge, large LED daytime running lights, and a red insert at the base of the lower air intake. Red brake calipers are visible through the bespoke 18-inch alloy wheels. The interior pictures show sporty Recaro seats with contrasting red stitching, and leather steering wheel trim with a stitched GT logo. The two new models will make their public debut at the 2013 Geneva motor show in March. Full prices and specifications will be revealed nearer to the cars' summer on-sale date, but we'd expect the Proceed GT to start from around 22,000. The Ceed GT is expected to cost from around 22,500.